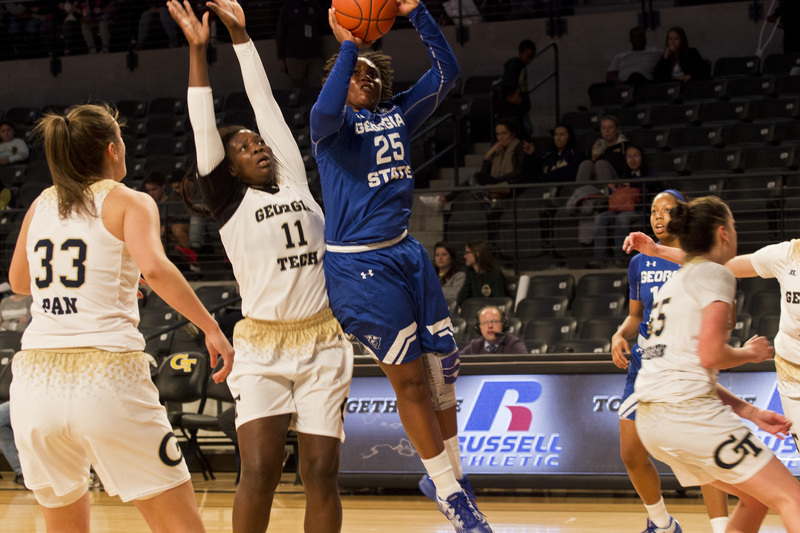 The Georgia State women’s basketball team is off a solid start this season with a (4-4) record through eight games. The team is (2-1) at the GSU Sports Arena, and (2-3) on the road and at neutral site locations. Coach Sharon Baldwin-Tener likes to have her teams play away from home so they are better prepared for conference play. “One reason that we have so many away games in the preseason is so that we’re better prepared for conference games because we have to play half of them on the road,” Baldwin-Tener said. So far this season the Panthers are averaging 64.6 points per game while allowing 62.4 points per game, which makes them a plus 2.4 in scoring margin. They also are better than their opponents in rebounding, assists, steals and blocked shots. The Panthers are also averaging fewer turnovers than their opponents, with a plus 2.9 turnover margin. Baldwin-Tener said into this season some a few of the major things that she wanted to improve were the team’s defense and game shape. Baldwin-Tener is correct in the fact the Panthers continue to be plagued by the injury bug. Two of their top players are out for the time being. Senior forward Tatianna Jackson is out for few weeks with a foot injury. The biggest blow, however, came with the loss of Sophomore point guard Madison Newby who is out for the season with an Achilles injury. Last season the Panthers were forced to play more freshman than they wanted, and Baldwin-Tener said that was something she wanted to avoid if it was possible. That is unavoidable now with Newby’s injury. The Panthers aren’t at an extreme disadvantage with Lewis and Harrison playing point guard because they are good players. Besides that though the Panthers do have an experienced team around them to help lessen the blow. Lewis has proven to be a freshman sensation so far for the Panthers. Coming into the season being a nationally ranked player she has exceeded expectations so far this season. The funny thing is, she doesn’t believe that she has been playing well. “Honestly, I don’t think that I’m playing well right now. I want to become more consistent offensively, and just become better all around,” Lewis said. Lewis is being modest, but she is averaging 9 points per game, along with a rebound and 1.5 assists on the season. She will get better with time, so the Sun Belt conference should be on notice for the potential freshman of the year. The biggest surprise this season has come from graduate transfer Tiffany Holston. Holston has arguably been the Panthers best player this season. She is averaging 11.9 points per game to go along with 9.7 rebounds per game. Holston even hit a buzzer- beater to give the Panthers a win over American in the San Juan shootout. “She gives us something that we’ve not had in awhile.She’s super athletic no question, but she has a great knack for the ball, she’s a great rebounder, can score around the basket, but can also score outside some as well and can pass for a big man,” Baldwin-Tener said. I think the fact that she’s played and she has a lot of games under her belt really helps and I think a lot of the players look to her. The Panthers have a few tough tests coming up with a game against Alabama, which should very good experience at the very least. After those games, they have the Holiday Classic at the sports arena before they begin conference play. First is a date with ‘That team down south’ their bitter rival. Baldwin-Tener has a difference in her team, and she likes it. “I think probably the biggest difference right now from this time last year is the competitiveness and the intensity,” Baldwin-Tener said. “I think we’re playing harder, I think we’re playing together a little bit better as well. Newcomers Tiffany Holston and Jada Lewis are averaging 11 and 10 points per game respectively. The Panthers are averaging 64 points per game this season.